At Keycode’s ScriptSync demo last week Michael Krulik described several smaller improvements that have been recently introduced, and I noticed a couple of others. It seems that Avid has been steadily incorporating such changes, but hasn’t done a good job of telling anybody about it. Hopefully, we’ll see more seminars like this one in the future. Along with the major improvements introduced in version 2.7, these represent some additional reasons to upgrade. I always leave sync locks turned on when I’m cutting. This feature inserts or deletes black in trim mode to keep you in sync. But for as long as I can remember, it hasn’t worked correctly in segment mode. Rather than simply fix the problem, Avid has made the fix a preference — in the Timeline Settings. I tried it briefly and it seemed to work. The same settings panel offers another choice, which many editors seem to be unfamiliar with: Auto-Patching. If you turn this on, your patching will automatically follow your track selection. As you select your tracks patching follows automatically. It’s quick and intuitive and might work for you. Meridien’s scrolling timeline disappeared in Adrenaline, but it’s back. 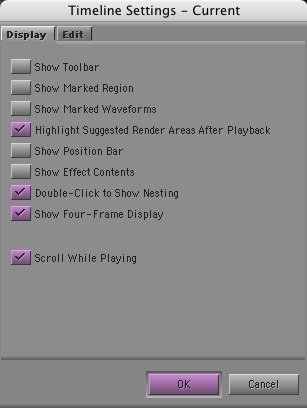 Just select “Scroll While Playing” in Timeline settings and the timeline will move under a stationary cursor. In general, timeline performance is much improved in 2.7, and dragging through the timeline feels extremely responsive. This had been a big problem in some early versions of Adrenaline. I’ll continue with more tips tomorrow. This entry was posted on May 12, 2007 at 8:25 am and is filed under Avid, Avid Technical Tips. You can subscribe via RSS 2.0 feed to this post's comments. You can skip to the end and leave a response. Pinging is currently not allowed. ahhhhh those little undocumented things in an upgrade… why they don’t make a bigger deal out of them I’ll never know.